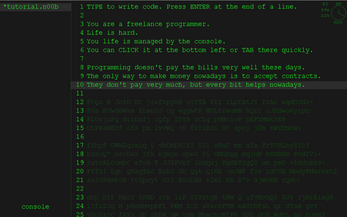 You are a freelance programmer. 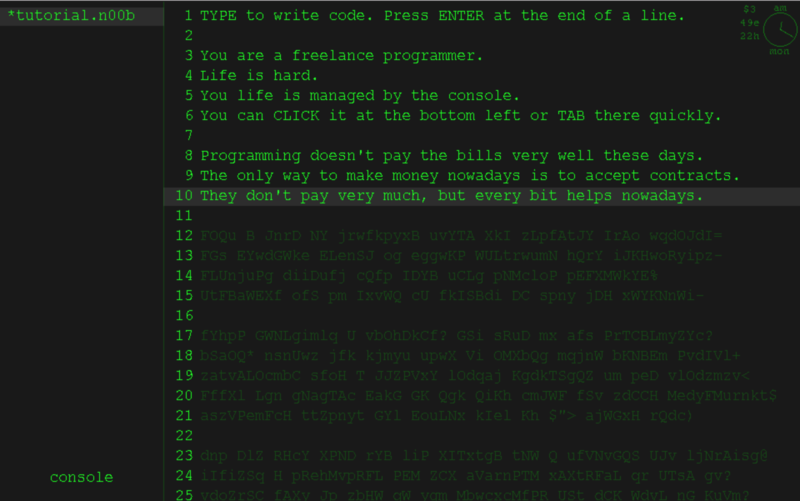 Programming doesn't pay the bills very well these days. The only way to make money nowadays is to accept contracts. They don't pay very much, but every bit helps. Life is hard. Your life is managed by the console. You can click it at the bottom left or tab there quickly. View available contracts using <contract list>. Use <contract accept> to accept up to 3 contracts. <contract current> will display your current contracts. Contracts may be added or removed at noon and midnight. After accepting a contract, you need to deliver scripts. First, create the right type of script using <script create>. Contractors want a certain script mentioned in the contract. Extensions determine the script length by the number of asterisks. Click the file on the left panel and start programming. Incomplete scripts are marked with an asterisk before them. You will get pain once all the scripts for a contract are complete. Use <contract complete> and specify a contractor to cash in. The less mistakes you make, the more bonus you will get. Previously sold scripts cannot be resold. A couple last things. <rent> is due at midnight everyday and is always increasing. You need to <eat> to satisfy hunger, and <sleep> to gain energy as well. You die with too little or too much of these. This game was made for three concurrent game jams with radically different themes: Scarcity, Meta Game, and Incremental/Clicker. Time, food, and money and sleep are things that are scarce both in this game, and in real life. With this game, I tried to create the feeling of constant pressure, struggling to spam type as fast as possible while trying to maintain some sort of accuracy to get that small bonus at the end. Especially as the days go on and your fingers start to tire as rent starts to rocket sky high, it can be incredibly difficult to remember to eat and sleep, making even your brain power feel scarce at times with such a simple mechanic such as spam typing. Speaking of spam typing, this is where the clicker part of the game is seen. I am not a huge fan of clicker games. I like games that challenge you and don't just play themselves after some time. The reason is usually due to the upgrades that auto click for you. In this game, there are no such upgrades. The primary reason for not having upgrades is that it would help remove the pressure of the game as time goes on, thus making the game easier. Yes, scripts could get longer to compensate but I felt that that would have made the game a little tedious. Another reason for not having upgrades is that it would take away from the feel of being a programmer, rapidly typing on your keyboard as deadlines approach. So I just stuck with the spammy part of clickers, where a single action like clicking or typing on your keyboard would be the main input for the program. Finally, the meta game theme. For this game I tried to create the emotions that come with programming most anything. The long hours, the semi-mindless typing, the "crunch" time with an upcoming deadline, and the evaluation of objectives. Now I haven't had much experience in the programming industry, but it's not uncommon to hear about these stories or occasionally have these feelings yourself. The main message that I am trying to get across with this game is to simply enjoy life. Most of us spend most of our time doing these three things: eating, sleeping and working. Some of us struggle like the programmer in the game to even get these three things done in the short time we have. The point is to go and do something different, something meaningful that you enjoy. Change things up from the norm and see what comes of it. I did. And thats how I got into game development. I see making games as a way of sending a message, much like a book or a movie, but with much more interaction. If you have read everything up to this point I applaud you. Thanks for reading that and I hope you have learned something here today. If you want to see more games from me, follow me so that you won't miss out on any of the upcoming games I will be working on. Enjoy, Have fun, and God bless. Not bad. Its a bit hard to figure out at first though.